ArtyFartyAnnie: My First Quirky Kit wooHOO!!! My First Quirky Kit wooHOO!!! I was SO excited when my Quirky Kit parcel arrived last week - so many beautiful papers and lots of other goodies to play with (see pics in an earlier post). I've had so much fun already and there's loads left! This first one was inspired by a sketch by Sandie Vincent in the June issue of Scrap365. 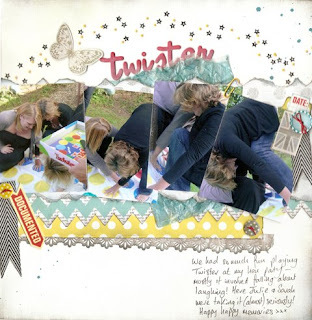 I used one of the patterned papers as a background and threw several more on top of it - I love how the papers aren't all from one collection - then added in one of the gorgeous vintage stamps and one of the beautiful little butterfly buttons. The Amy Tangerine alphabet, Elle's Studio cutouts, doilies and vintage style trims were all included - I didn't need to add anything except ink and glue. There were several different sizes of glassine envelopes in the kit and I had lots of fun experimenting with those. 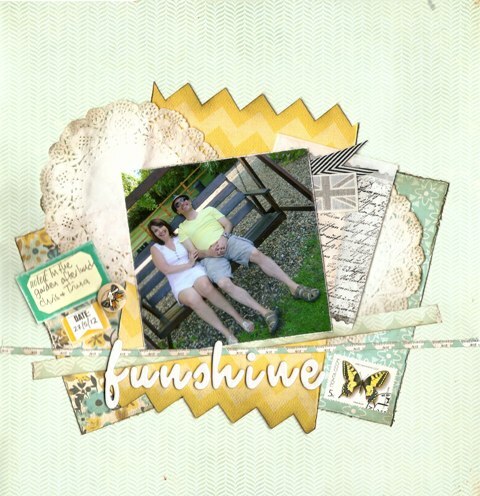 For this layout, I stamped a script background onto the glassine paper using Stazon - but I have loads more ideas to try! This one was also inspired by one of this month's Scrap 365 sketch, by Katherine Sutton. You can't really see the organza fabric which I've tucked in behind the papers, but it's a beautiful soft grey. I chalk inked the base of the alphas this time to make them stand out against the background and I also coloured the bee on the cotton trim with Whispers markers. The butterfly and the chevron were cut out of some of the patterned papers. I added a sprinkle of stars and another cute button from the kit and also the bits you tear off the envelope which photos are delivered in , because I thought it looked interesting. 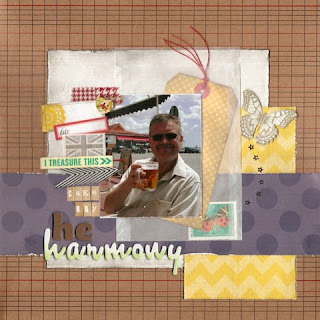 I've entered this one for the Scrap 365 June Challenge. It's inspired by a sketch from Wendy McKee. This time I've added in a handful of yellow seed beads, a paper clip and some floss. It's the same alphabet but coloured with red ink this time. The glassine envelope was crumpled and coloured with alcohol inks. And last but not least - this one is for the June Simple Recipes challenge at UKScrappers -thanks to Mel from A Trip Down Memory Lane. 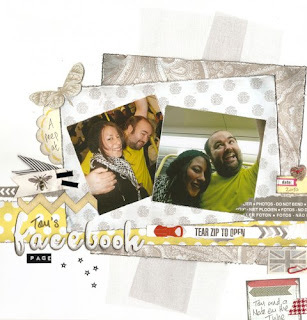 This page shows my lovely husband before I met him and I used the glassine envelope to hide my journalling as it's a bit soppy! Apart from the gorgeous photo (!) I only added 2 thickers foam alphas, some floss and a scrap of washi tape. Oh and the kraft background. And I haven't even started on the mini kit yet......! Oh wow these are fantastic!!!!!!!!!! Great pages! I really like the wonky layering on those first couple of pages. It is fun and whimsical. Love your scrapbook layouts, I am wanting to return to scrapbooking, yours are so inspirational, thank you. Please use this link when replying or the stamping Ground blog link.